What can the success of HiyaCar teach startups about crowdfunding? 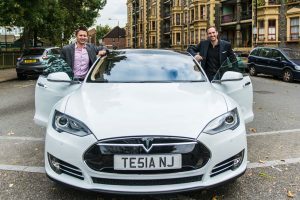 Graeme Risby and Rob Larmour founded HiyaCar with the shared vision of revolutionising & evolving the UK car-sharing industry. Hi there Graeme and Rob. 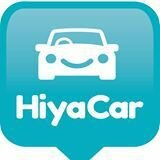 Tell us more about HiyaCar..
G: Airbnb for car hire. It is a platform to match car hirers to car owners, turning idle cars into income generating assets. Car sharing is great for the environment and the economy whilst peer to peer sharing bridges the inequality gap and brings people together. HiyaCar raises aspirations for those who previously could not afford certain models of cars or have no access to cars. How did you use your Startup Loan from Startup Direct? R: We used a £25000 Startup Direct loan for a deposit for the initial platform itself. Without this initial cash injection we could have never purchased the platform. What problems did you overcome at the beginning of your Start-up? R: We faced issues with getting insurance. Trust is essential in a sharing economy and so insurance was essential for our start-up. Eventually, after much perseverance, we pitched to Aon and a number of other big corporate businesses who were very keen to work with us. We also pitched to AXA and secured their backing. It took lots of effort on our part and took over a year to secure. G: For us crowdfunding was a no brainer. Our concept is peer to peer and we are all about community. Crowdfunding allows people to invest in a concept and helps people get involved at early stage and grow with you. R: We used the Seedrs platform with help from Startup Direct resident crowdfunding expert, Paul Grant. His help was invaluable. How did SUD help you with your crowdfunding campaign? R: Paul Grant spent a lot of time giving us great advice and worked with us throughout the campaign. At the start of the campaign everyone had told us how great our video was, but he told us to completely re-do our video and re-shoot it to under 3 minutes and gave us real detail about what should be in the video. He told us what to do if the crowdfunding campaign dips and how to get attention to your campaign in this scenario. G: Paul Grant told us to bring down funds raised total and go live with the minimum amount you need to get your startup to market. We wanted £250k but went live with £140k for 11.8% equity as Paul advised that we can always overfund. In the end this was the right strategy. We hit this campaign total 100% within 5 days and then over funded to £300,940k within 15 days. We were only on seeders for just over 2 weeks and gave 24.05% equity for £300940. People from over Europe provided funding which gave real validation to what we were doing. R: Paul also advised us to start our campaign with at least 40% already funded to incentivise early funders. This was key. We went live with 50k drummed up offline (40% funded) from close friends and family. Both: Without initial funding from Startup direct and help from Paul Grant we would still be just 2 guys with an idea. What is your business vision? Where do you see yourself in 5 years? 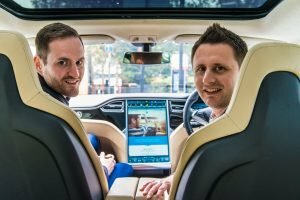 R: In 5 years time we want to have the largest community of Car Sharers and Drivers. G: Want to get to a stage where it is common practice to share your car for hire when you are away to help a car pay for itself. We want to help give more people access to car travel. What can the success of Hiyacar teach start-ups about crowdfunding? R: Start trading asap. This provides some social proof of your start-up success when you go to market. We couldn’t do this and so would suggest that if you cant do this, surround yourself with some big partners. We have Aon/AXA etc. Additionally when crowdfunding try and get as much offline funding as possible (need at least 40% funded before you go live). Also bring down total target for crowdfunding as it is better to overfund than underfund. G: Trade if you can. Get questions ready and answer questions that come in efficiently (rob did this quickly with informative answers). You do get lots of people asking for your business plan-What we did was take it offline and send them a 2 page summary or sections of the business plan rather than the whole plan. R: Do not underestimate the effort that goes into a crowdfunding campaign. There is lots of effort and PR needed to maintain exposure. You must be available to answer questions quickly and efficiently. People judge your campaign through interactions with you. Additionally hold a launch event to boost you profile. G: With the crowdfunding video, think of it as like a film trailer of your business and make it around 2 minutes in length (max). It should not be a summary of your business as you want people to click through into your campaign. Thank-you Rob and Graeme. Congratulations on your fantastic business.